The Chateau Feely organic and biodynamic trail is a physical trail with information boards in the vineyard and a more detailed virtual trail that will be available at ChateauFeely.com. 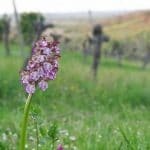 Its objective is to explain organic and biodynamic farming and winemaking and why it is so important. Visitors will walk a short information trail with panels linked via QR code to more information online about the subject. The trail then continues with an optional 1.5km walk in the vineyards. The core subjects covered are what is organic; what is biodynamic; organic and biodynamic winegrowing; organic, biodynamic and natural wine-making and actions we can take. The initiative is dedicated to the memory of Pierre Masson, a pioneer and thought leader in biodynamics, who gifted the horn and the crystal that form part of the trail. This living trail, that will be constantly evolving both in the vineyard and online, offers a new way to discover Chateau Feely. Guests can walk the trail €5 per adult, free for children; experience the trail and a gourmet organic picnic €20 per adult including a Feely wine between 2, €8 for children; or visit the trail via the website. A picnic area with table and chairs and picnic blankets is available for those who select the gourmet picnic. The new trail complements a wide variety of wine experiences ranging from one hour to five days. Gift certificates, vine shares, accommodation, tours and wine can be bought directly from www.ChateauFeely.com. High resolution photos and full details of the visits available at Chateau Feely are available on demand caro@ChateauFeely.com. 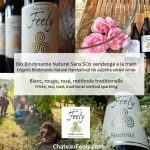 Chateau Feely is maker of award winning natural, organic and biodynamic wines and winner of two Best of Wine Tourism gold trophies for visits and accommodation. Sean and Caro Feely moved from Dublin city to pursue their dream of organic wine farming in France in 2005. Chateau Feely offer luxury ecological accommodation, a wine school and multi day wine tours including vineyard walking tours. Caro Feely’s books include: Grape Expectations, Saving our Skins and Glass Half Full about the couple’s experience and Wine, the essential Guide. The Chateau Feely blog explores organic wine and more.